Bring out the popcorn, boys and girls! In about two days, the Italian Parliamentary Election will take place. With a strong incumbent Prime Minister Mario Monti and former Prime Minister Silvio Berlusconi both in the running, the outcome of the upcoming election is anything but definite. Many analysts believe that the race for Prime Minister will be a close one. In fact, public opinion polls recently held showed that Monti’s camp lead over Berlusconi’s coalition has decreased to just 3.5%. The forecast, to say the least, is quite worrying. If Berlusconi wins, Italy could return to where it was towards the end of 2011–in shambles and in need of a bailout. Silvio Berlusconi, one of the world’s richest men, is an Italian politician and media mogul. He quickly rose to the limelight of Italian politics in 1994, when he was elected to the Chamber of Deputies for the first time. Since then, he has been Prime Minister 4 times. In his last term, due to the growing fiscal problems related to the EU sovereign debt crisis, he was forced to resign as prime minister. During his long political career, Berlusconi has been involved in more than 20 court cases, including tax evasion charges, underage prostitution assertions, and abuse of office allegations. In contrast, current Prime Minister Mario Monti, while being far from perfect, has done some good.During his time in office, he was able to reduce the country’s huge budget deficit significantly and introduce modest reforms. What could possibly happen to the euro? This brings us to an interesting scenario with the euro. 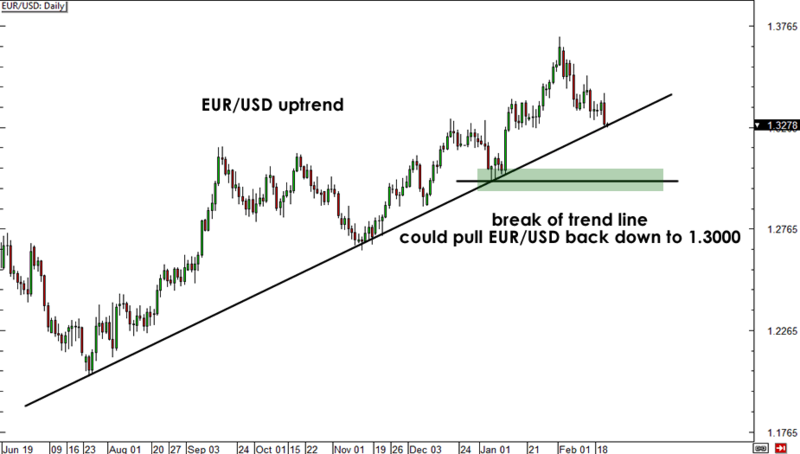 As of this writing, the pair is testing a rising trend line, whose break could lead to further losses for EUR/USD. With selling pressure on the euro building up in recent days, the results of the elections could very well serve as a catalyst for a major breakout. From a long-term perspective, if price can manage to bust through and hold below this trend line, it could signal the start of a NEW trend and lead EUR/USD back down to 1.3000. But then again, those are just my two cents on the matter. How do you think the elections will affect EUR/USD? Will the Italian elections send EUR/USD lower?